André Carrilho, in his late 30’s, is a caricaturist of the highest order. He’s Portuguese, lives in Lisbon, where he’s a national treasure. His work frequently appears in The New Yorker and Vanity Fair. His daring is breathtaking. There are no clichés in his work. Every drawing I’ve ever seen by him has made me jealous: I wish I had done that. His work deserves close study, his gestures, his radical departure from anatomy, his mixture of drawing techniques, his psychological insights. For now I just want to focus on the fact that he frequently dismisses the eye as the carrier of expression. 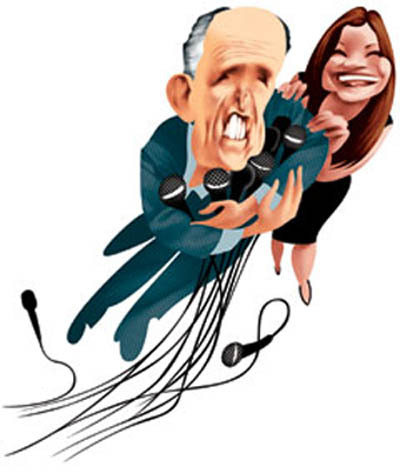 Rudolph Giuliani, for example (above), doesn’t have any eyes, just a darkish smudge. To pull this off, you have to be very advanced in your art. Go to http://www.andrecarrilho.com/ and immerse yourself in this work. But be warned, you may lose track of time, miss your train, quit your job, and neglect your household chores. Funny thing about the eye, the “window to the soul.” That expression probably can be traced to Moroccan bazaars, where haggling over the price of a rug was made easier if you were so close to the other guy that you could see the involuntary twitch in his pupils every time he lied to you. In general, I think, soul-talk is obfuscation. The “soul” in art doesn’t just have a window here and there, but is more like a drafty place, a wide open canyon. 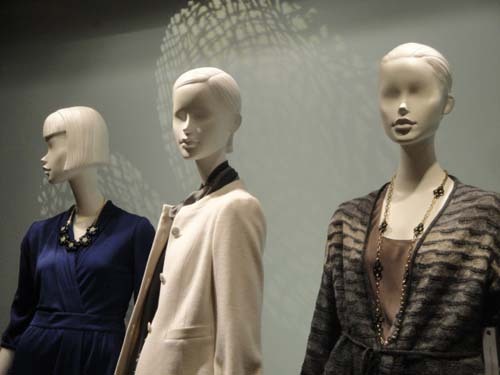 Imagine my delight as I’m looking at store mannequins and find that they have no eyes. Where does this come from? What happened to “the window to the soul?” Is Maybelline suing? Is this inspired by André Carrilho? I wouldn’t be surprised. The Art of Caricature is not silly or trivial at all. It’s the brain’s preferred way of seeing. Simplify, simplify. All contents copyright (C) 2010 Katherine Hilden. All rights reserved.